Good morning beautiful people! So nice of you to stop by, why don’t you grab yourself a cuppa and let’s visit. It is such a nice and crisp morning why don’t we sit outside. I have been busy outside these past weeks. Impressive amounts of weeds have been removed from my borders, the boxwood has been trimmed, and some necessary border makeovers are in progress as we speak. But all of that may give me a wonderful feeling and a nice orderly garden, but it is not the kind of makeover you come around here for. The big outside projects, like painting those garden walls , are slowly coming to a stage were I can start to blog about them, but they are not Songbird worthy just yet. So I thought I’d show you a mini project I have been doing. I thought let’s whip up some garden labels. Ever since I saw these cute beauties at Manuela’s from The Pleasures of Homemaking I wanted to have them too. Manuela is known for using all kinds of whimsical kitchen elements in her garden but I thought these garden labels were the best. I don’t know if my cutlery was made out of harder steel, if my letter stamps were not tough enough or if I was too much of a klutz. But no matter how hard I tried and how many of my old thrifted little spoons I was ruining, I couldn’t make it work. But I had to have them…. So I came up with a variation that I could pull off. I found some of aluminum tape in the basement. It is a shiny, very thin tape that is used to plug holes in water drains. It is rather soft an pliable, so I wrapped it tightly around some stiff cardboard. The only thing left to do was rub a little ink in the letters and glue them to my tiny spoons. Oh, and in case you are wondering, the labels are of course in Dutch. I don’t usually go around speaking English at home (although I catch myself thinking in English all the time, wonder why that is happening…). The labels look so cute in my little herb garden on the patio. I dressed my little corner up with some garden accessories, like this lantern that I removed the glass from to use it as a planter. And I stuck a birdie in a nest of flowers. Actually to be able to do that I had to remove the rock the birdie was sitting on. That turned into a leg amputation as well. So in fact you can all call me a bird mutilator now. But amputated birdie and all, I am really pleased with my herb garden. And it is so much fun to just walk outside while cooking, scissors in hand, and just snip off some fresh herbs for dinner. So do you have a herb garden? Or would you know why I couldn’t get those spoons stamped? And have you ever amputated a little bird? I'd LOVE a herb garden. But know what's pathetic? I don't know what to use with what. When I moved to this home, the garden was full of herbs. And I tended them but never used them. I sooo need a herb/cooking book! Your labels and garden corner… so sweet! Hey, jij bent er lekker vroeg bij vandaag! Je plantenstekers zijn helemaal te gek! Dat is een idee wat ik ga vasthouden…Niet dat ik plantenstekers nodig heb in mijn tuin, op de een of andere manier weet ik precies wat waar staat… Maar het staat wel hartstikke leuk! Lieve groetjes en alvast een heel fijn lang weekend, het weer zal mooi worden! awww, poor little bird…what a cute idea for garden labels…that looks adorable!!! I love your pretty little herb garden. We are currently planning the creation of a patio, so maybe once we have that done I can add some lovely pots of sweet smelling herbs. I love your labels! I'll have to look for some of that tape; I've been trying to find something cute to use as labels, and that would work. wow your blog is just beautiful. All of it. This little herb garden is so quaint. I took a look at some of your older posts too, you do some fantastic work, and the photography is amazing. I tried to make plant markers out of silverware and had the exact same problem. So I can't help you there. In the past I've had herb gardens. This year I am not planting. I have to try to get a handle on the my really bad rodent destruction and the weeds from when we went on vacation last year!! I do love a good garden makeover. Yours is just gorgeous. Brilliant idea Marianne! I am so doing this, this weekend. And yes, I have accidently mutilated a little craft birdie before, in an attempt to make it work better in a project. Needless to say, that project didn't get finished. Love your herb garden. And those markers are really great. I have an herb garden which I am still cleaning out weeds in. I will post about mine when I am done. There is nothing like fresh herbs from your own garden when cooking, is there? Oh goodie gumdrops! I'm so glad you stopped by my blog, thank you! Now I get to see your adorable spoons. I live in an area with a lot of farmland and there are plenty of places you can rent gardening space. I was thinking of buying myself a plot for nice fresh summer vegetables. Well, now that I saw this cute project I HAVE to! I love your whole blog…it's absolutely adorable. I'm following you now : ) Have a great Thursday! First of all, spoons are the easiest to use. I found that if I pound them flat first it made it much easier to hold the letter stamp stil. Then you just have to be butch with it and hit it hard! But really it's not hard. Give it another try! 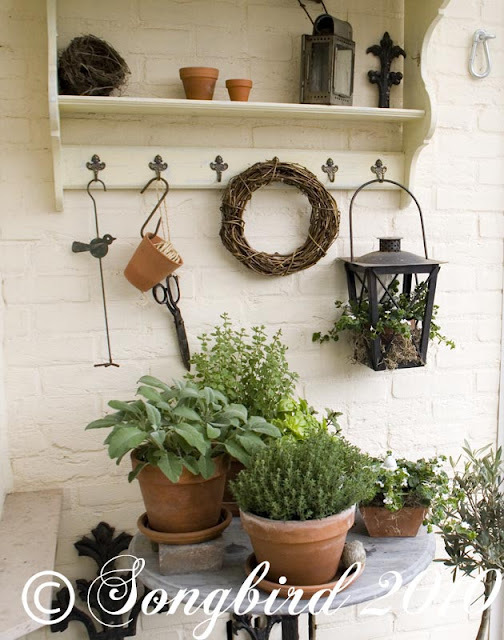 Your little herb nook resembles a beautiful European shop! I can only imagine what the rest of your place is like!!! Never amputated a bird. I once knocked off the arm of a two inch plastic army soldier while trying to replace his bayonet with super glue. Yep, that's not what I call crafting. But it's necessary with little boys. I have an herb garden right out my front door by my kitchen. It makes me smile. Big. I love using herbs in just about everything I cook or bake or prepare…including smoothies and brownies!!! A little green can always help us wherever we are! So glad I hopped on over today! Oh I adore those labels. . . I am going to have to try my hand at those!! Marianne, you've dressed the outside space up beautifully! I love to go out into my garden, scissors in hand, and bring some herbs into the kitchen. Your garden is lovely. It looks so fragrant and fresh. I too love herbs…i like making jelly with fresh basil…it is sooooo good!